(Bloomberg) -- Investors are never short of trading ideas in China’s $7.6 trillion stock market. On Thursday, they found inspiration in a very far off place, in the form of a super-massive black hole. Companies linked to space telescopes and optical lenses bucked broader market declines after scientists released the first-ever image of a black hole. Phenix Optical Co. surged 9.9 percent in Shanghai to the highest since June. 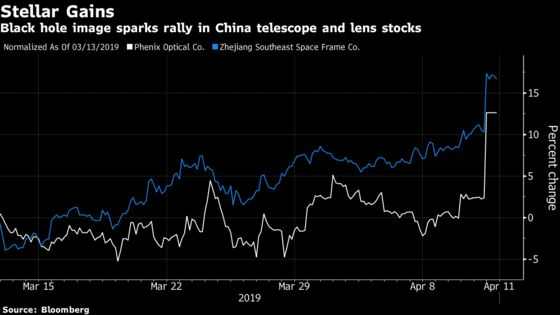 Zhejiang Southeast Space Frame Co. jumped as much as 10 percent before closing up 3.3 percent, while Shanghai Moons’ Electric Co. climbed more than 4 percent before erasing gains. The Shanghai Composite Index slid 1.6 percent, its biggest loss since March 25. China’s mom-n-pop investors are no strangers to quirky trading, from buying stocks with names that sound like U.S. President Donald Trump to those that share the same Chinese character as the securities regulator’s surname. Companies with even the loosest links to next-generation 5G networks were among favorites this year, though that trade quickly unraveled. Zhejiang Southeast and Shanghai Moons’ weren’t alone in turning lower after an early surge. Hytera Communications Corp., which develops radio terminals and wireless communication products, went from a 4 percent gain to a 1.2 percent loss. All three companies have products used in China’s Fast radio telescope project.